In the Caribbean region, the United Nations Development Program (UNDP) and the Bureau for Crisis Prevention and Recovery (BCPR) have been advancing the creation and consolidation of a Trans-cultural Network to promote exchanges and cooperation in the region, and establish linkages between different linguistic communities (English-, French-, and Spanish-speaking groups). The network also fosters two current thematic trends: risk management and adaptation to climate change. In the context of this process, and in partnership with the European Commission’s Humanitarian Aid Office (ECHO), two knowledge fairs were held to exchange experiences, demonstrate and disseminate practices and tools, and establish plans or agreements for cooperation and collaboration among Caribbean countries. The first knowledge fair titled “Reducing Disasters through Community Preparedness: Transferring Experiences and Promoting Cooperation among Caribbean States” was held in Bridgetown, on December 12-14, 2006. Focused mainly on the English-speaking Caribbean, the fair was held simultaneously with the Caribbean Conference on Comprehensive Disaster Management (CDM Forum), organized by the Caribbean Disaster and Emergency Response Agency (CDERA), with the financial support of the Canadian International Development Agency (CIDA) and the Office of U.S. Foreign Disaster Assistance (USAID/OFDA). These events brought together more than one hundred representatives of national and regional institutions and organizations involved in risk reduction. Eleven thematic sessions and forums provided the opportunity to discuss and exchange experiences, knowledge, best practices and tools as a contribution to risk reduction, disaster preparedness and measures of adaptation to climate change. An exhibition area included twenty information stands where national and international organizations displayed a number of training and information materials, information technology and geographical information systems software for risk assessments and early warning systems, educational materials, videos and more. The fair also included cultural activities, paticularlly for children. With the signing of 11 letters of intent, this first gathering laid the groundwork for horizontal cooperation and led to the establishment of agreements among different Caribbean countries, institutions and organizations to collaborate, cooperate and exchange experiences. More than 250 delegates of Caribbean institutions and organizations involved in risk reduction attended the second “Reducing Disasters through Community Preparedness: Transferring Experiences and Promoting Cooperation among Caribbean States” knowledge fair. 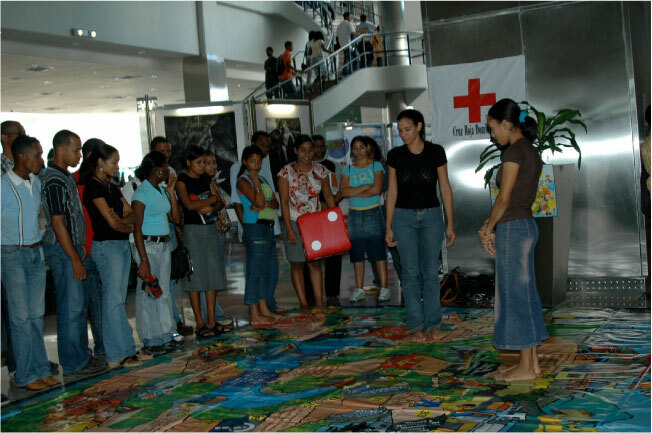 This time, the fair venue was Santo Domingo, Dominican Republic, and activities were held from February 5 through 8, 2007 These were four intensive days of exchanges, presentations and demonstrations surrounding what it is being promoted and implemented with respect to risk reduction in the region, particularly in terms of national and community-based disaster preparedness and early warning systems. A total of 13 sessions were devoted to discuss early warning systems, forecasting, monitoring and warning, community preparedness, risk assessment and risk mapping, dissemination and communication, and the sharing of experiences and lessons learned. Additionally, 5 forum sessions covered other issues, such as challenges to risk management in the region, planning and infrastructure, disaster management strategies from national and regional perspectives, international funding mechanisms, and risk reduction in the Dominican Republic. Lasty, four workshops and training courses covered water and sanitation issues in emergency situations, radio communications with the Red Cross, OFDA’s damage assessment and needs analysis, and post-disaster socioeconomic assessment. The fair also served as an opportunity to exchange and demonstrate practices, tools and products. Several organizations and institutions set up stands to display their publications, information materials and videos to participants, students and the public at large. Other activities included evacuation drills, demonstration of potable water production equipment, community preparedness theater, movies discussion forum, “Riskland” games, and field trips to community preparedness projects in Bajo Yuna. Finally, the creation of a Registry of Horizontal Cooperation Initiatives was promoted, through which interested organizations and institutions could sign voluntary agreements. Groundwork was laid for horizontal cooperation, and 27 letters of intent were signed as the first steps to establish agreements among different Caribbean countries, institutions and organizations in order to collaborate, cooperate and exchange experiences.